A Lancashire landlord has appeared in court for ignoring instructions from a fire and rescue service to carry out essential maintenance on his property. On 7 June 2013, officers from Lancashire Fire and Rescue Service (LFRS) visited a house in Westminster Road, Morecambe, which was owned by Eli Zohar. LFRS found that the emergency lighting was in a state of disrepair and there was no suitable system of maintenance in place. Zohar was issued an enforcement notice, which required him to carry out the required maintenance but he failed to comply. If you are unsure which fire extinguishers and fire blankets you require, or if you are worried about conforming to The Regulatory Reform (Fire Safety) Order 2005, you can ask us for a free site-survey. Our NEBOSH qualified Fire Risk Assessor will then visit your premises and make no obligation recommendations for your fire safety needs. 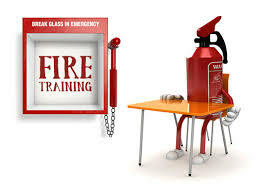 We are able to deliver Fire Safety Training Courses at your premises. Our fire safety courses are a combination of theoretical knowledge and practical sessions designed to develop ability and most importantly practical confidence.